"2ROSEBUDSCAB" STAINED AND LEADED GLASS WINDOW CUSTOM AT GLASS BY DESIGN. 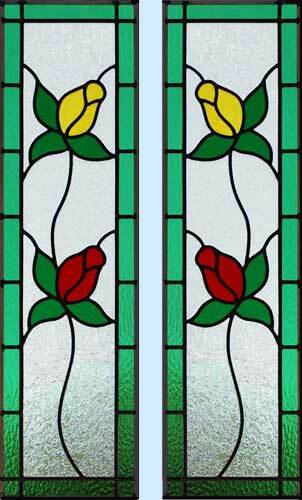 This 2 Rosebuds custom stained and leaded glass design makes a colorful sidelight, cabinet doors, or anywhere else you need this configuration. More rose buds can be added to fit your space. Click picture or scroll down for cabinet doors.